As Asia leads the global economy in recovery, it is time for Asian companies to shift from supporting supply to creating their own market opportunities. Asian companies are now spending more time and resources in building their own brands. 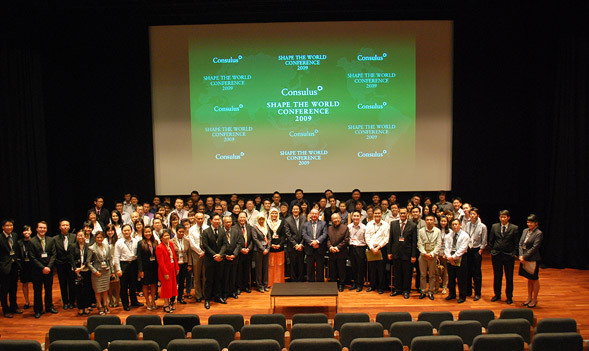 Consulus organised the Shape the World Conference (STWC) to serve emerging Asian companies that are feeling the pressure to build a brand. 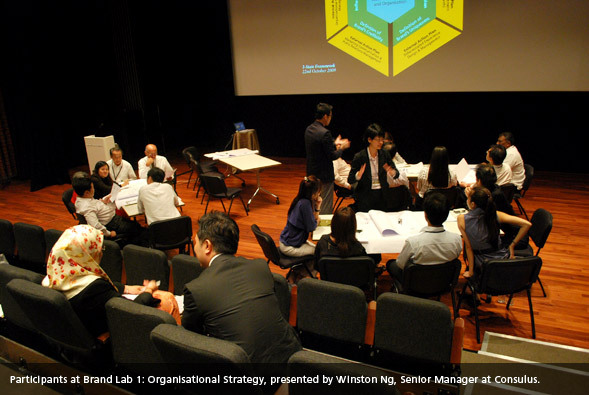 Held at the National Museum of Singapore on 22 October 2009, STWC is unlike other branding and marketing events in that most of the speakers were not consultants but business and organisational leaders in the thick of their own branding efforts. The conference theme, “Why Should I Care About Your Brand?” highlighted the need for organisations to understand that brand building goes far beyond advertising or marketing. “The era for gimmick-based, short-term branding is over, as the internet has given more power to the customers. Only a brand that is values-centred with a meaningful purpose can shape market opportunities,” Lawrence Chong, Director for Strategy Development at Consulus, said in his keynote speech. For branding to be effective, it has to start from the inside out, beginning with business strategy to organisational roll-out. Nurul Akmar Jaafar, Head of Sales and Distribution Channel at Bank Islam Brunei Darussalam (BIBD), said during the morning panel discussion that achieving employee buy-in was a common challenge faced by companies when launching a new initiative. In the case of BIBD’s ground-breaking Wish Campaign, pre-launch training workshops for the managers and all the front-line staff helped the bank overcome the challenge. The speakers offered diverse perspectives on building brands in Asia, such as how a local pathway school worked to rebuild hope among its students and how the head of a regional roof drainage company managed the brand internally and externally. “With all the talks from the different companies, both SME and MNC, we had a lot of good insights on how they run a company,” conference participant Issac Tang, Technical Manager at Siow Chiang & Co Pte Ltd, said. At the same time, the conference addressed the challenge of the social-conscience economy, where more and more people have come to expect companies to adopt responsible branding and marketing practices. “Indifference is public enemy number one. The ethical as well as operational failures of Wall Street, along with increasing cynicism of consumers, resulted in less brand loyalty,” Azril Mohammed Amin, former president at Angkatan Belia Islam Malaysia (ABIM), said in the panel discussion. The audience also questioned the role of external consultants. Should companies engage a consultant to build the brand from the start? Or should they concentrate on the bottom line first? The panelists all agreed that the organisation must first determine their own brand purpose before considering an external consultant. “The branding has to be purpose-led. If you know the reason why you need a name or an identity for your business, embrace that first before engaging anyone,” Jaafar said. “It’s not about [the external consultant] telling you what you need to do. It’s about you sharpening your thoughts with them, maintaining a stand, but being open,” Wee Tat Chuen, Principal at Assumption Pathway School, added. For panelist Colin Thoms, CEO at Fast Flow Group (FFG), the company that designed and installed roof drainage systems for such high-profile projects as Beijing’s iconic Bird’s Nest Stadium, brand building became a natural off-shoot of his company’s dedication to delivering the best for its clients. “We didn’t set out to create Fast Flow as a brand in Singapore, [yet] we command a premium and people know who we are. That’s because we are very, very efficient at what we do. We deliver. People’s expectations are always met. If you focus on doing all those things, your brand should happen,” Thoms said. With that in mind, the participants broke into smaller groups to take part in the afternoon workshop sessions, which focused on three areas, namely organisational strategy, design strategy and communication strategy. “It’s very interesting and it’s also very practical, in terms of understanding the product and the company and how to employ the branding strategy. It’s definitely useful for the company,” conference participant Wong Chung Meng, General Manager at CSS Industrial, said. 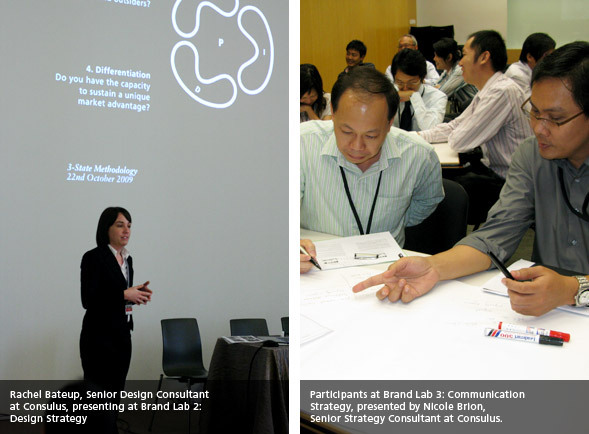 Originally launched as Building Great Brands Congress in 2004, Shape the World Conference 2009 saw more than 100 participants from Brunei, Vietnam, Malaysia and Singapore. Taking on a new format with panel discussions and hands-on workshops on topics such as organisational, design and communication strategy, the conference allowed participants to hear first-hand insights from real companies in the midst of building their own brands, as well as to put the theories they had learned into practice.